“A fascinating, fast-paced history…full of remarkable characters and incredible stories” about the nineteenth-century American dynasties who battled for dominance of the tea and opium trades (Nathaniel Philbrick, National Book Award-winning author of In the Heart of the Sea). Steven Ujifusa received his AB in history from Harvard University and a master’s degree in historic preservation from the University of Pennsylvania. His first book, A Man and His Ship, tells the story of William Francis Gibbs, the naval architect who created the ocean liner SS United States; The Wall Street Journal named it one of the best nonfiction titles of 2012. 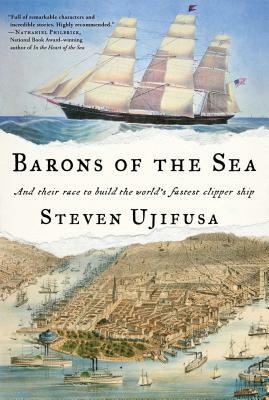 His new book, Barons of the Sea, brings to life the dynasties that built and owned the magnificent clipper ships of America’s nineteenth-century-era of maritime glory. Steven has given presentations across the country and on the high seas, and has appeared as guest on CBS Sunday Morning and NPR. A recipient of a MacDowell Colony fellowship and the Athenaeum of Philadelphia’s Literary Award, he lives with his wife, a pediatric emergency room physician, in Philadelphia. Read more about him at StevenUjifusa.com.